We have received some new pictures from Ethiopia. Our sister church in Alaba is being built! The name of this church is Bedene. 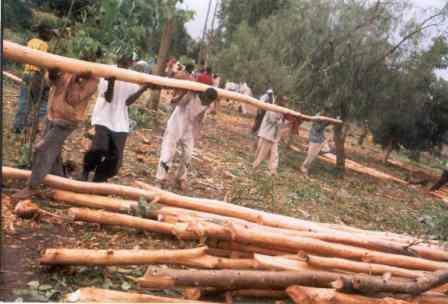 The people cut down tall Eucalyptus trees and remove the branches and bark. The church is a simple rectangle. These trees are placed close together in a cement base to form the perimeter (walls). The walls are filled in with mud and straw. The roof is corrugated tin. The floor is packed mud. There is no electricity and there are no restrooms. The windows are wood shutters. This church is being built on the place where the Muslims burned their Bibles. It says to the community, “Jesus Christ is alive, and Christianity is here to stay.” Lord willing, we will visit this congregation on Tuesday, Dec. 26, 2006. Tabernacle Baptist Church of Mecklenburg County, VA, has adopted the Bedene congregation of Alaba. They are helping by providing funds for a tin roof, cement for a perimeter foundation, and solid wood for windows and doors. The Bedene people do all the labor themselves. They cut the trees for the poles, dig the sand from the rivers and the rocks from the fields for the cement, and they work to erect the building. The believers from several churches come together to help in the building. They sing as they work. They sing of their Savior, the Lord Jesus. In one rural community, a favorite song is “Let the Gospel expand!” Many Muslims convert to Christ because they see the joy and peace in Christians, even in midst of severe persecution. In African culture, a building shows power, authenticity, and permanence. Muslims are watching: Is the Christian God able to provide for His people? Is the Christian God strong? Is He real? Is He here to stay in our community? Inflation has hit Ethiopia in a very bad way. The people are suffering as the cost of food has doubled in just the past 6 months. The cost of the cement tripled between May 06 and Oct 06. 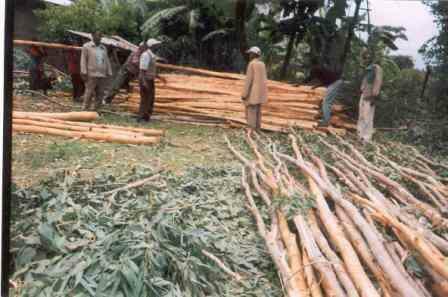 The price of tin, nails, and wood has also increased tremendously. 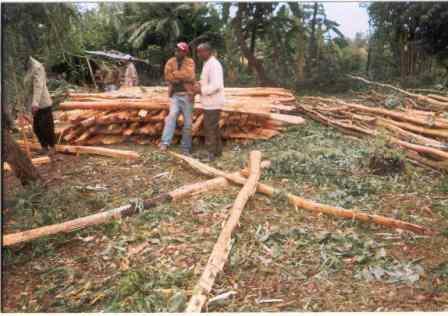 Should we abandon these Ethiopian churches because of their economic situation? No! We will continue to move ahead at whatever speed our Lord allows. 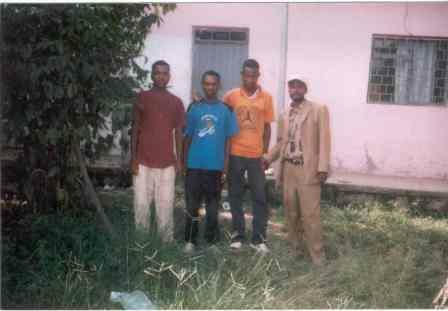 The three young men in this picture have been taken into hiding by the mother church in Alaba Town. They have come to our Lord Jesus for salvation, and their Muslim families and neighbors are trying to kill them. The Muslims move in groups, ambushing new Christians. They take them to the mosque and beat them, trying to get them to say that Jesus is not God and only Allah is God. A Muslim family is very embarrassed when one of their own forsakes Islam; they would rather kill their own family member than bear the shame. Kedir is standing to the right of these boys; he is a leader of the Bedene church. The church is now trying to provide housing, food, and clothes for these boys. This further stretches an already-tight budget. (The boys are about ages 18-25. The Ethiopian economy is so difficult that a man is not self-sufficient until about age 30-35.) Please pray for these young men from Bedene village and the others like them in Alaba, Ethiopia.